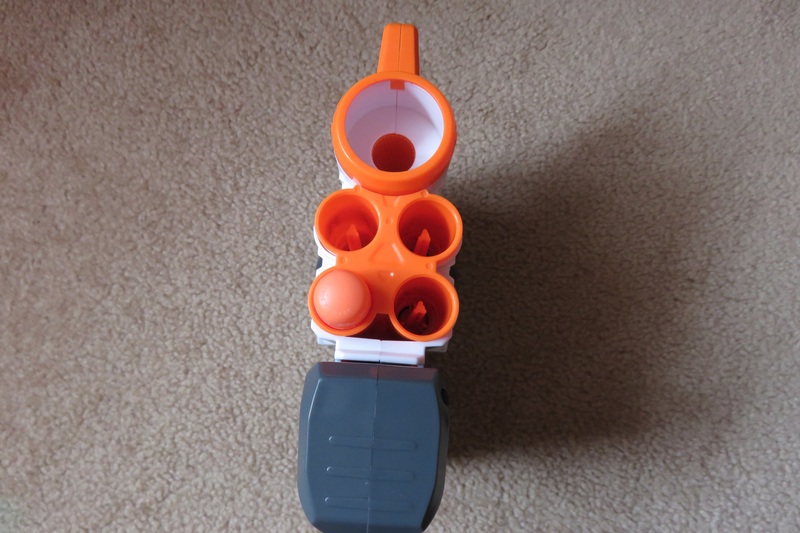 Only effectively fires 1 of 3 ammo types. While the Nerf Modulus Tri-Strike isn’t the first Elite-era blaster to fire multiple ammo types, it is the first blaster to fire three different ammo types. 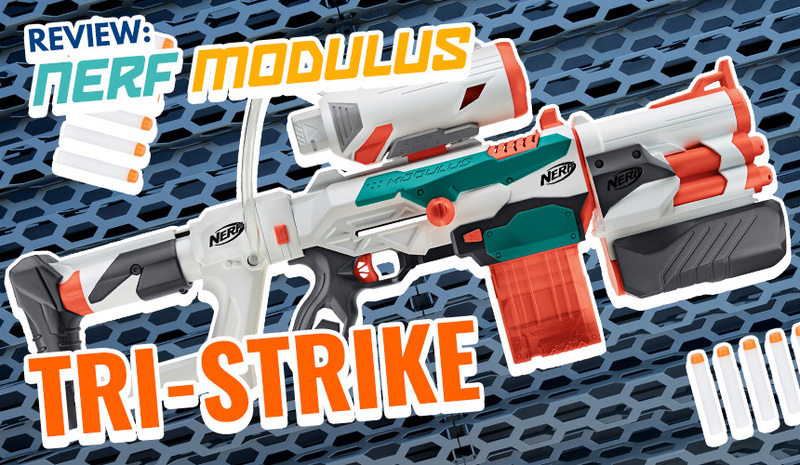 Firing attachments were one of my biggest hopes for the Modulus line, so the Tri-Strike was one of the most exciting releases for me this year. I did wait a little for the price to drop from its initial release price, but I was very excited to pick one up for myself. Everything included in the Tri-Strike box. Cardboard tray removed from the box. Fairly standard box fare, all the main components are exposed and can all be inspected. 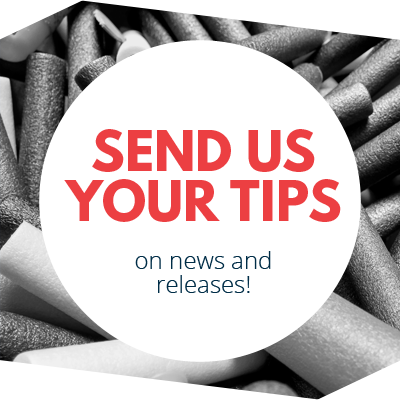 The ammo and instructions are packed away in a corner, out of sight. Looking at the muzzle piece. 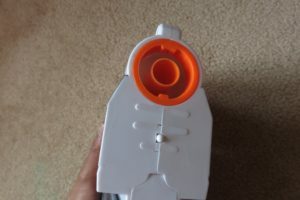 Stock attachment point on back. 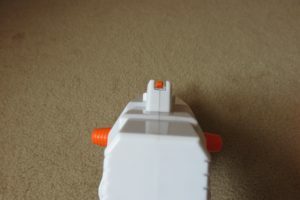 Looking down the iron sights. The base Tri-Strike blaster is a very Retaliator-like piece, being a relatively compact mag-fed blaster. 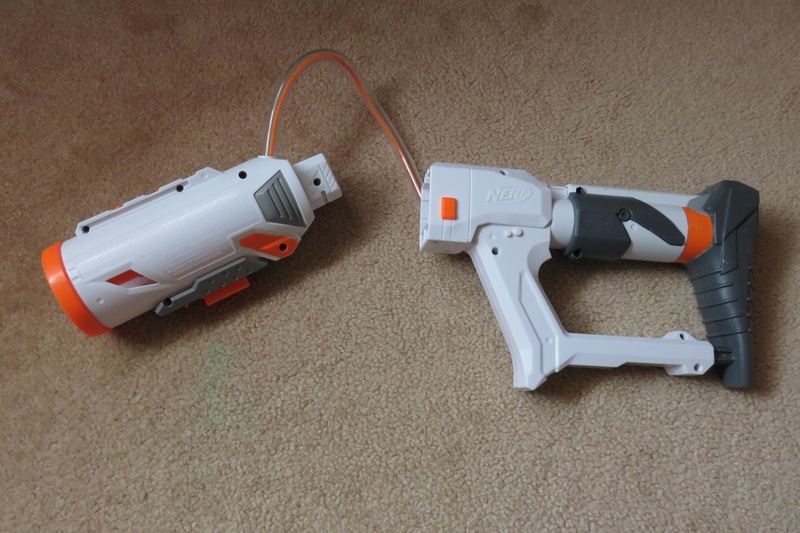 Its one main difference is its bolt handles versus the Retaliator’s top slide. Detail wise, the Tri-Strike seems better than a lot of Nerf’s recent offerings. 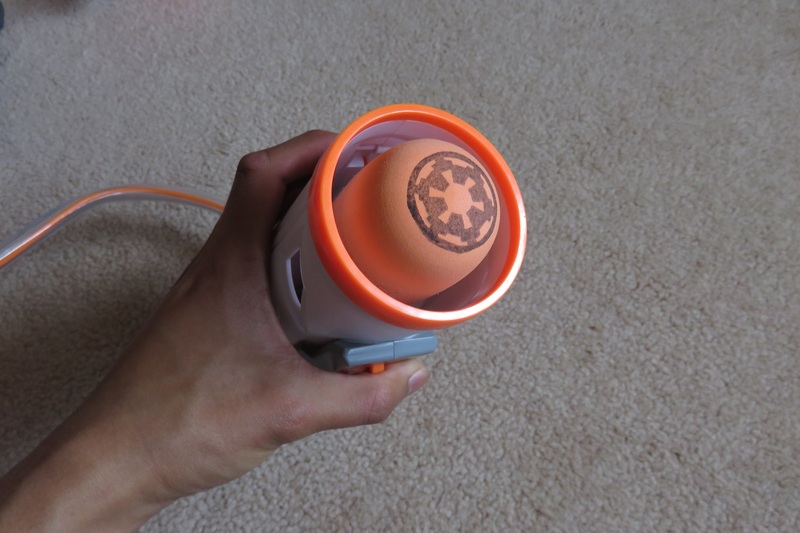 Though there is still some obvious overspray, for the most part its lines are quite clean. Furthermore, the only detail on the right side missing from the left is black paint on the “NERF” protrusions. 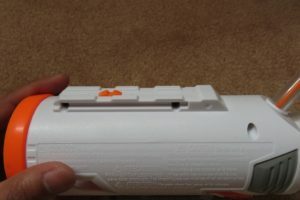 On the front of the blaster, the Tri-Strike has a small divot below the muzzle used to lock barrel extensions in place. 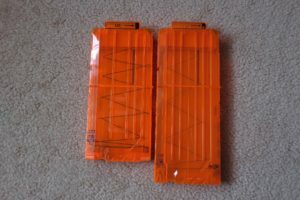 Additionally, there is a little patterning on the front, along with the obvious orange paint. 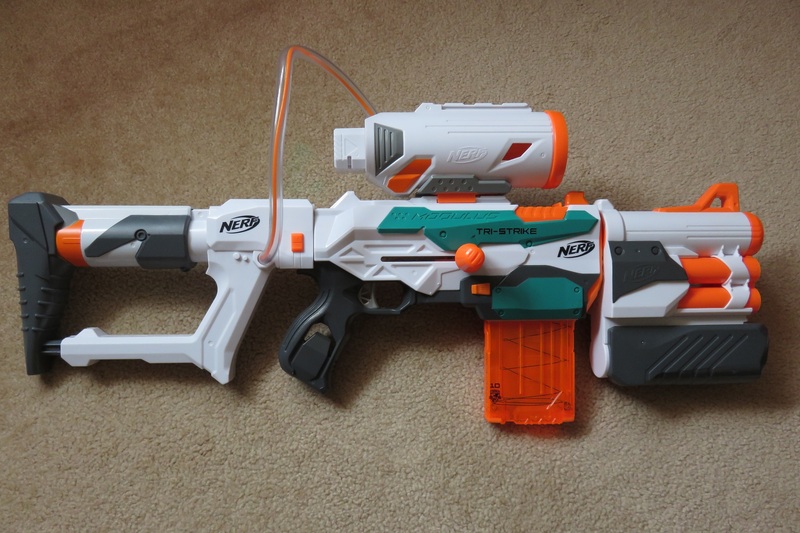 The Tri-Strike is all round quite a good looking, good quality blaster (in contrast with the Recon MkII). 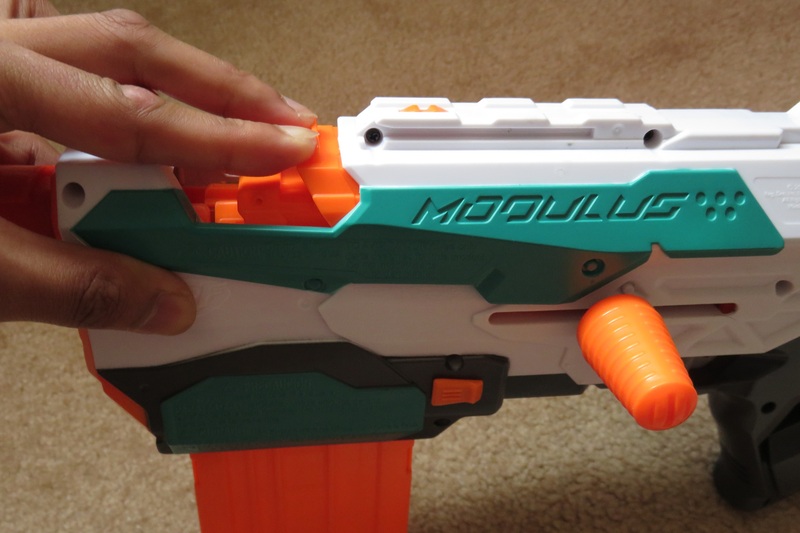 While the Tri-Strike has a Modulus-style handle, its lines have been smoothed over and so it is rather comfortable to hold. 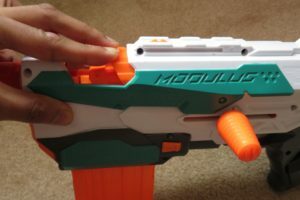 I personally find the front edges of the handle to be slightly too sharp, although it’s still far more comfortable than the original Modulus’ handle. The Tri-Strike’s bolt handles are quite small, being only two-thirds the size of those found on the Longshot and Longstrike. While I personally find them reasonably comfortable, their small size may pose an issue if you have large hands. Magwell with a mag inserted. The Tri-Strike is a pretty standard mag-fed blaster, with the magwell up front. 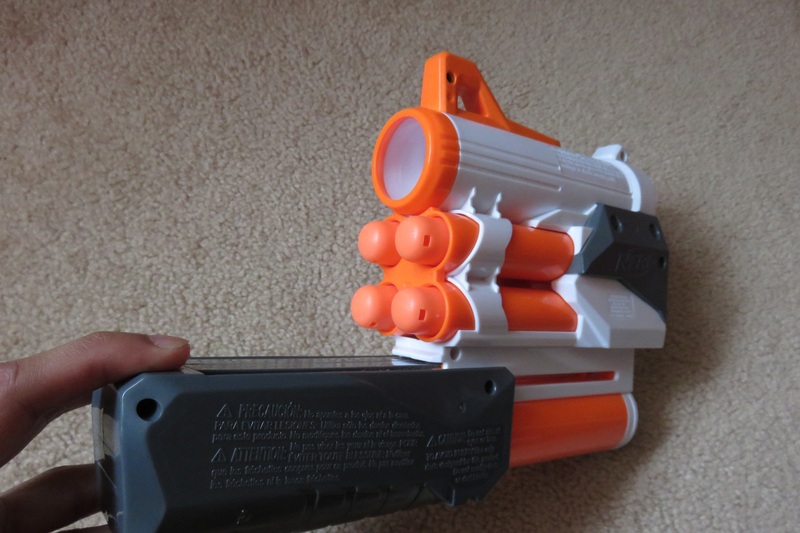 It accepts all Nerf mags including drums. 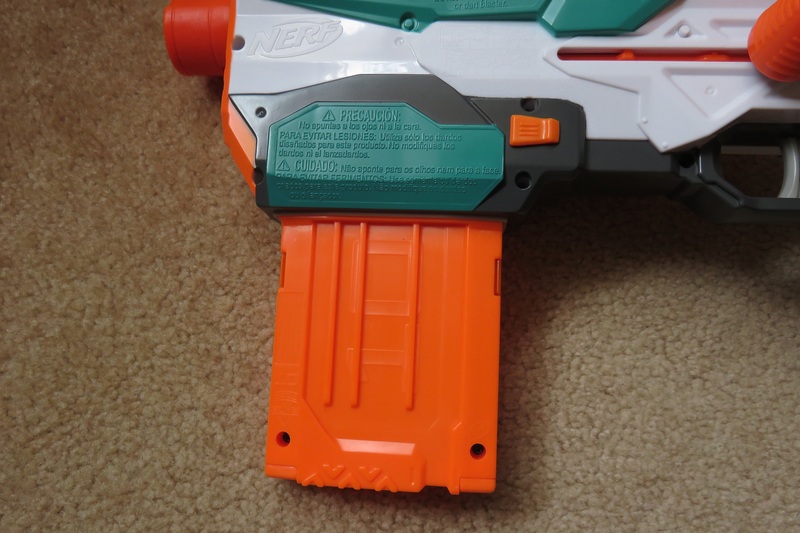 It has mag release buttons on the side of the magwell, like with the Retaliator. 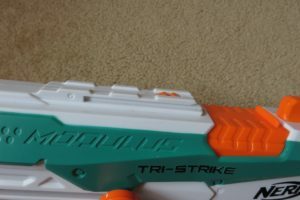 This presents an issue however, as the Tri-Strike’s magwell is further forward than on most other blasters. As a result, the mag release buttons are not reachable from the handle without very long fingers. 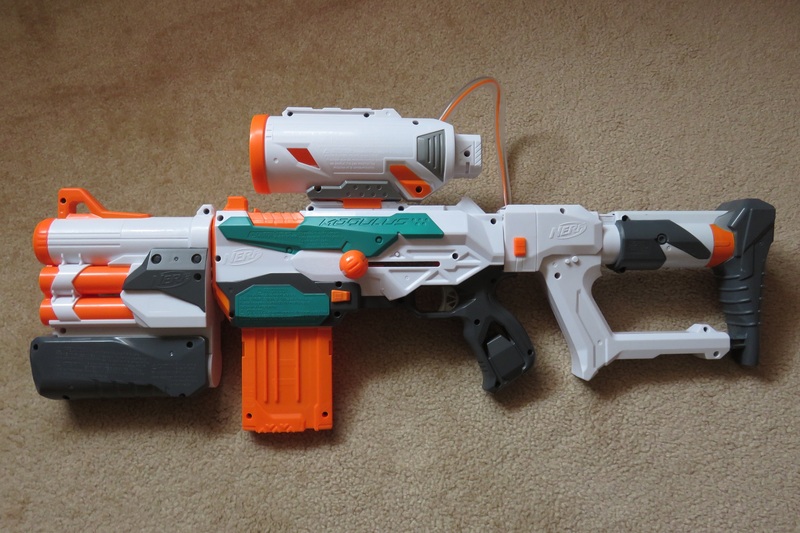 This is unlike the Retaliator and Recon MkIIs, whose mag releases are easily reachable. 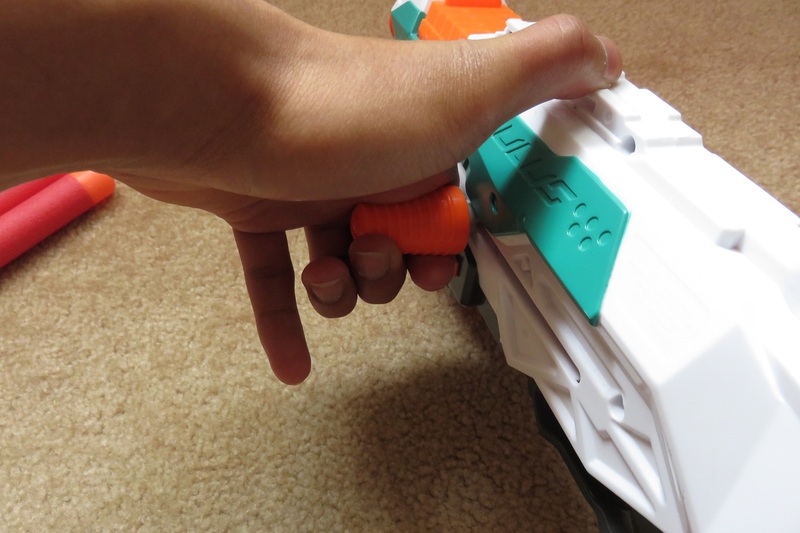 This necessitates actuating the mag release with your off hand while clasping the mag, which is quite an awkward action. 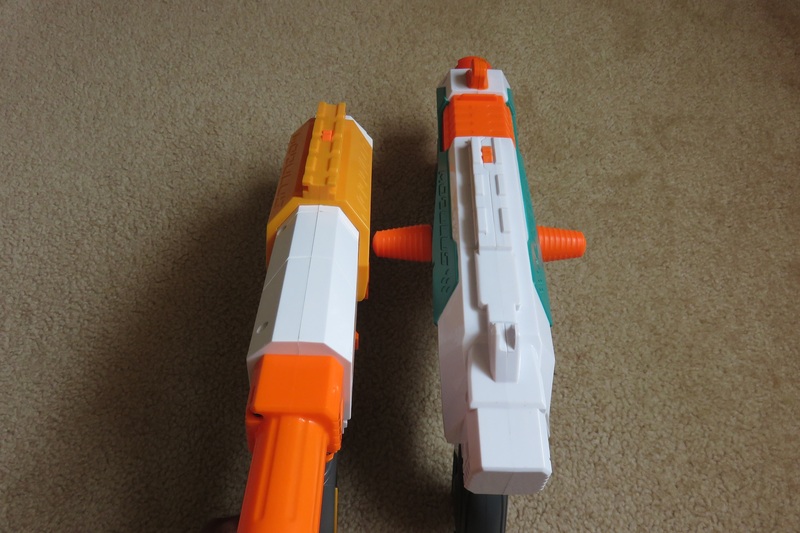 As such, I find reloading the Tri-Strike to be worse than most other blasters. Pushing the jam door to hold the bolt open. 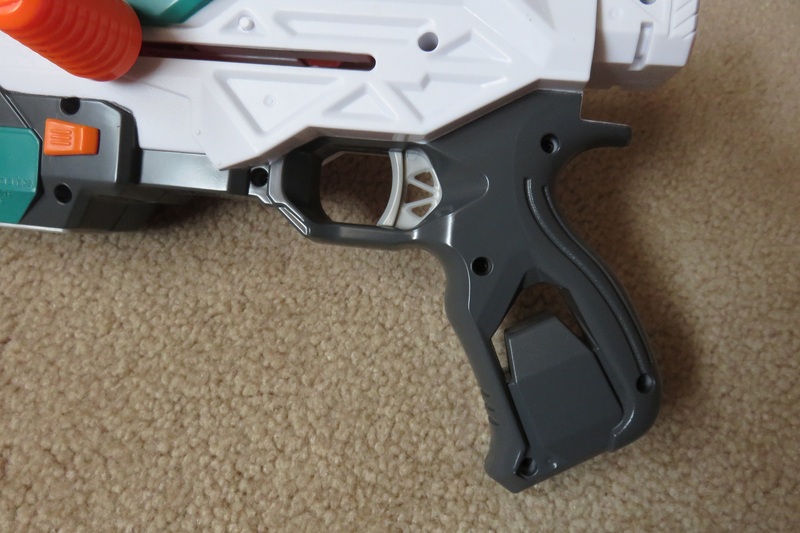 The jam door and aperture on the Tri-Strike are pretty small, comparable to the Retaliator and Recon MkII. Unlike those blasters, the Tri-Strike’s jam door slides open. Interestingly, pushing the jam door back when the blaster is unprimed will open up the bolt partially. Most blasters have some sort of jam door lock, and in the case of sliding jam doors, they stop the jam door sliding back unless the bolt is open. 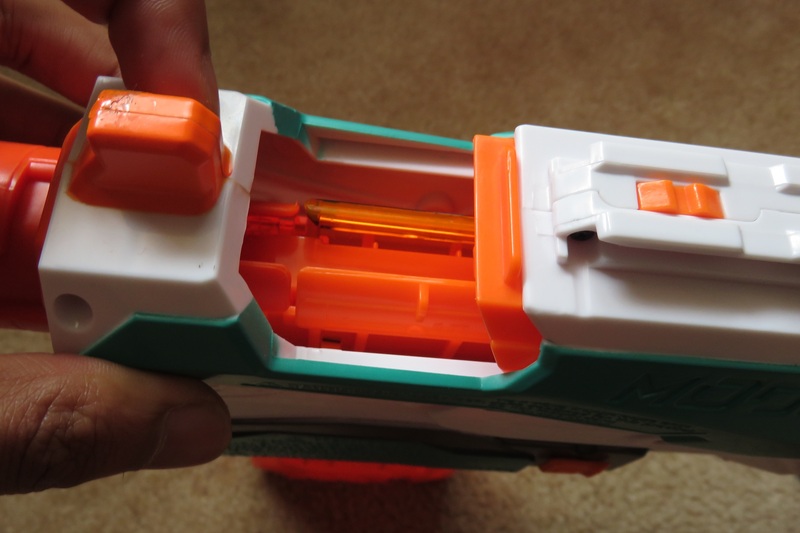 Additionally, every springer blaster with a sliding door pushes the jam door closed if the bolt is closed. 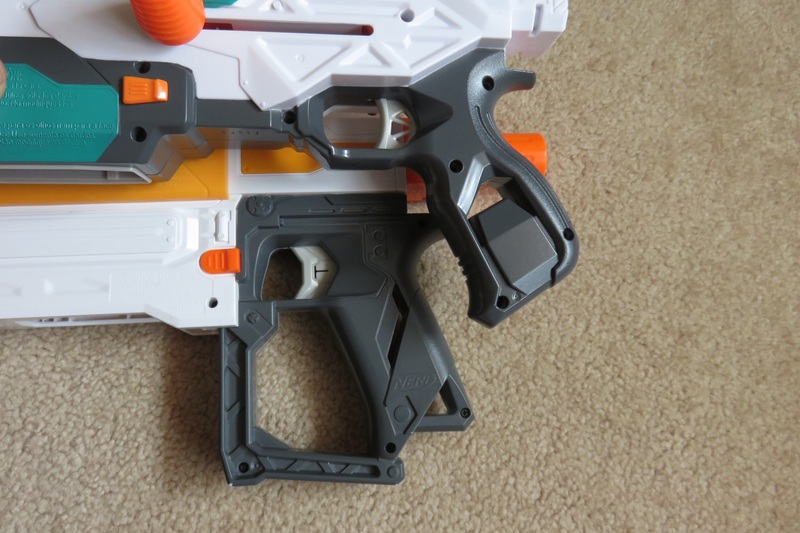 The Tri-Strike lacks this lock, so while the jam door closes when the bolt is closed, the jam door can also push back the bolt. 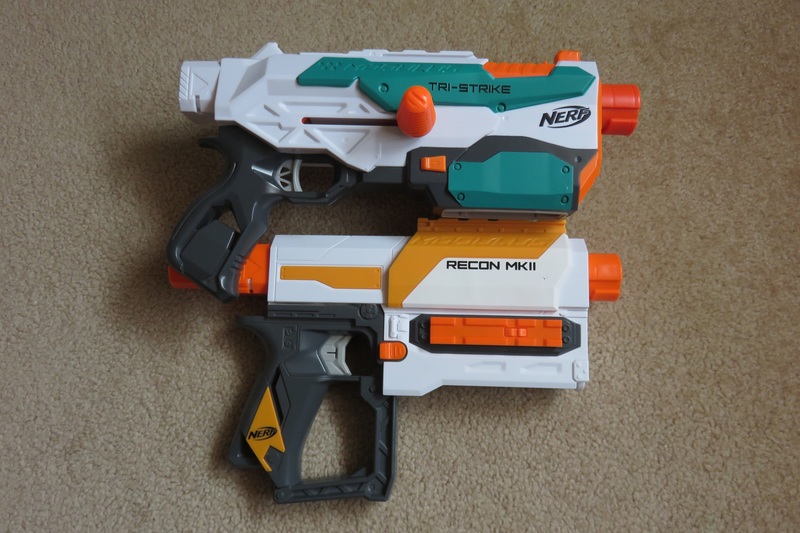 Tri-Strike next to a Recon MkII. A comparison of the Tri-Strike and the Recon MkII, two similar but also quite different blasters. 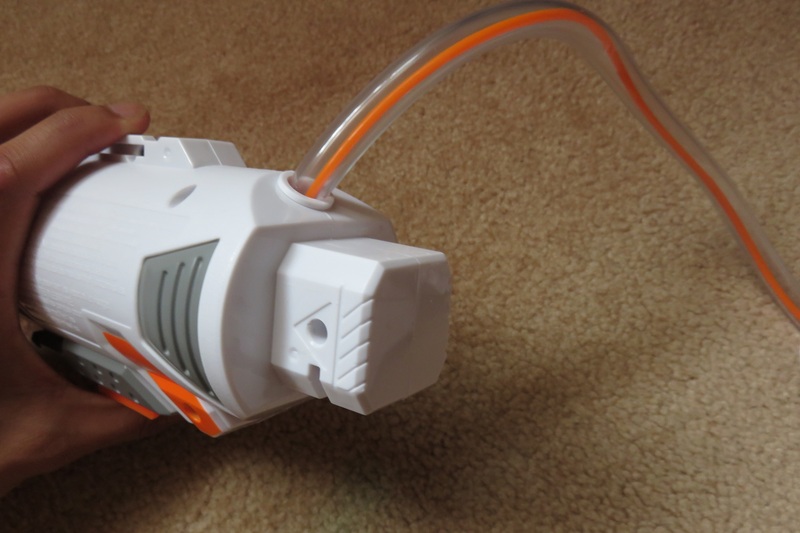 The first important difference is the priming mechanism. 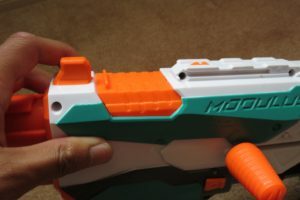 The Recon MkII uses a top slide, while the Tri-Strike uses a bolt. 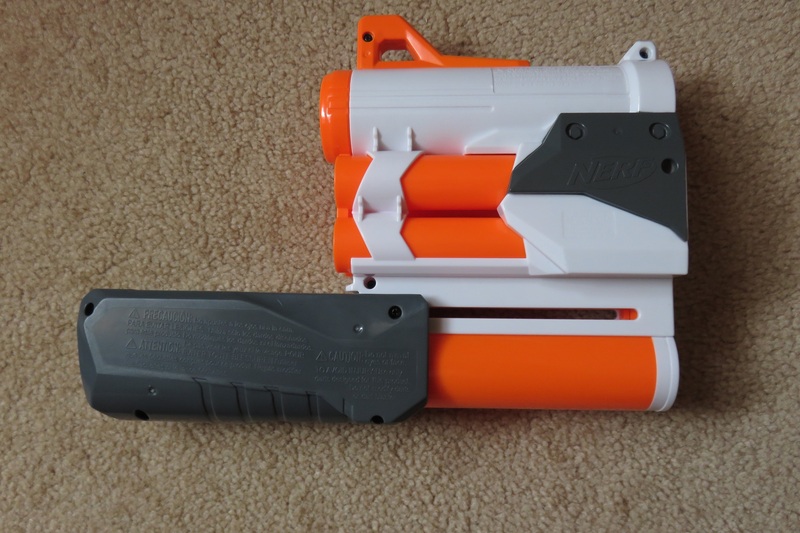 While top slides are often some of the most awkward priming mechanism, the Recon MkII is compatible with aftermarket Retaliator pump grips, whereelse the Tri-Strike is not. The second important difference is the overall length. 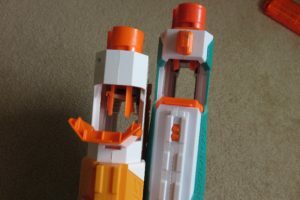 The distance between the Tri-Strike’s handle and muzzle is noticeably greater than with the Recon MkII, making for a slightly longer blaster, and a much more awkward reload. The jam doors are also quite different, though less important than the aforementioned two. 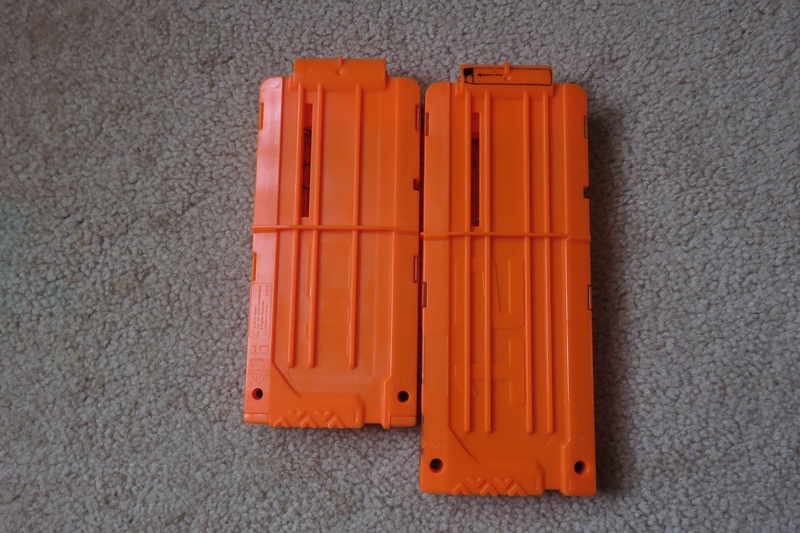 10 mag next to a 12 mag, left side. 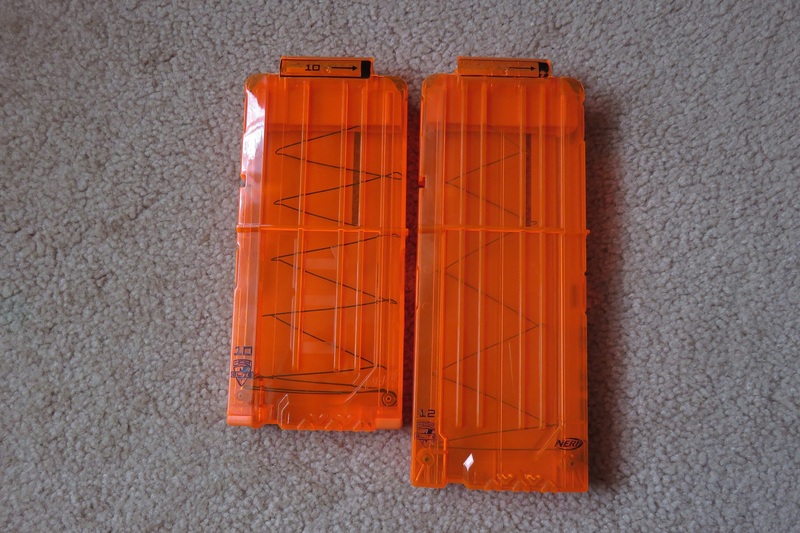 The included 10 dart mag is exactly what it sounds like – another N-Strike magazine sized-up to hold 10 darts. It is slightly shorter than a 12 dart mag, naturally. 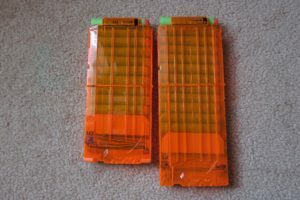 I find it a little odd that Nerf would bother designing a new 10 dart mag for the Tri-Strike, when including a 12 dart mag would have been easier, and perfectly acceptable. 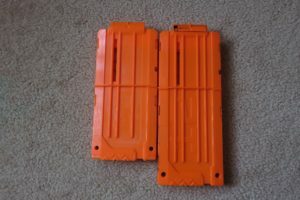 Personally, I would actually have preferred a 12 dart mag for the extra capacity. Rear view, note the locking nub and the odd protrusions. The Mega Launcher is a barrel extension capable of firing 4 Megas. 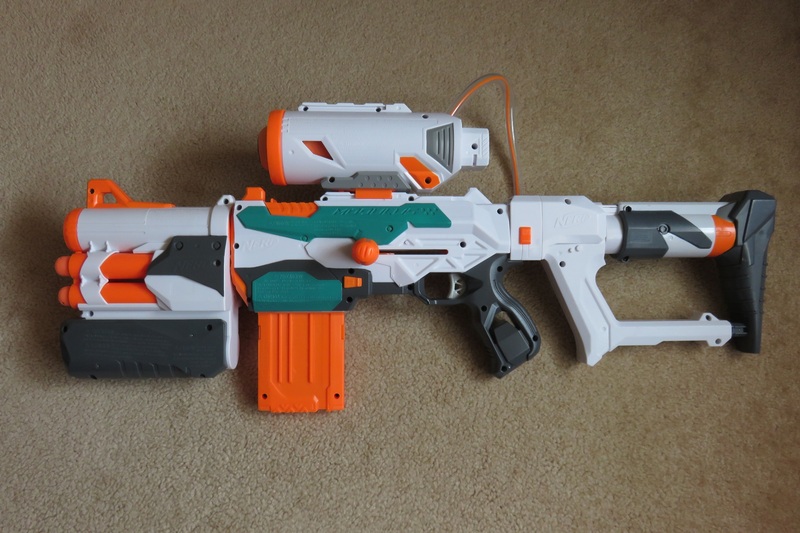 It’s quite a stubby piece, but is quite tall to accommodate the actual blaster. Unlike some of the smaller Modulus barrel extensions, the Mega Launcher has a spring loaded nub on the back that helps lock it in place on blasters. 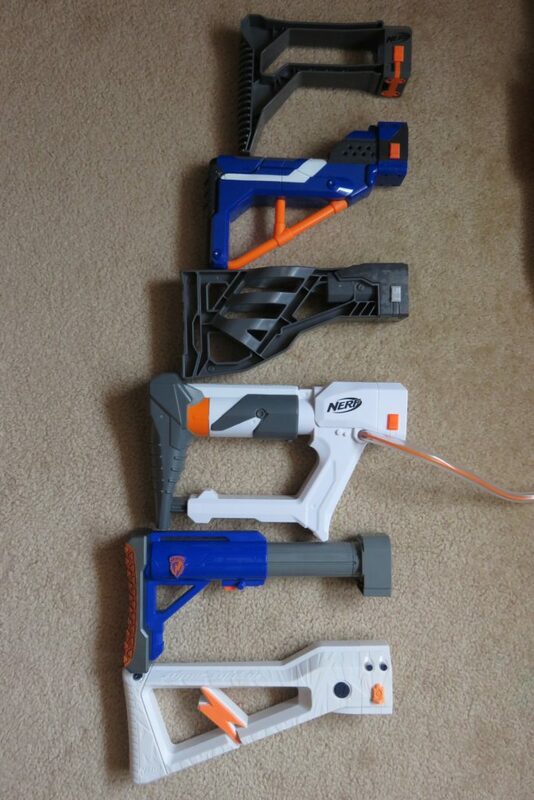 Loaded up and ready to fire. 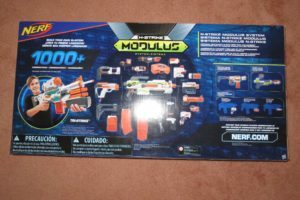 The Mega Launcher is a pump-to-fire blaster. 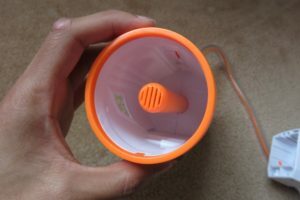 Simply pull the pump handle out all the way, then slam it back in to fire a dart, and repeat for all remaining darts. The harder you slam it back, the faster the Mega will be fired. 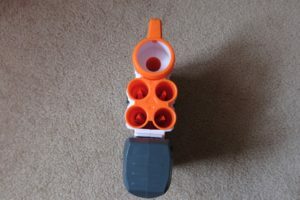 The Mega Launcher uses a block of Smart ARs to cycle through its darts. 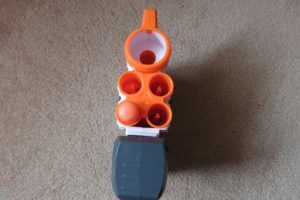 From the user’s perspective, the Launcher cycles clockwise, starting with the bottom left dart. Since the Smart AR system introduces more dead space in each subsequent barrel, there is a noticeable power loss cycling through each barrel. Furthermore, there is an issue of darts being double-fired in one firing stroke. 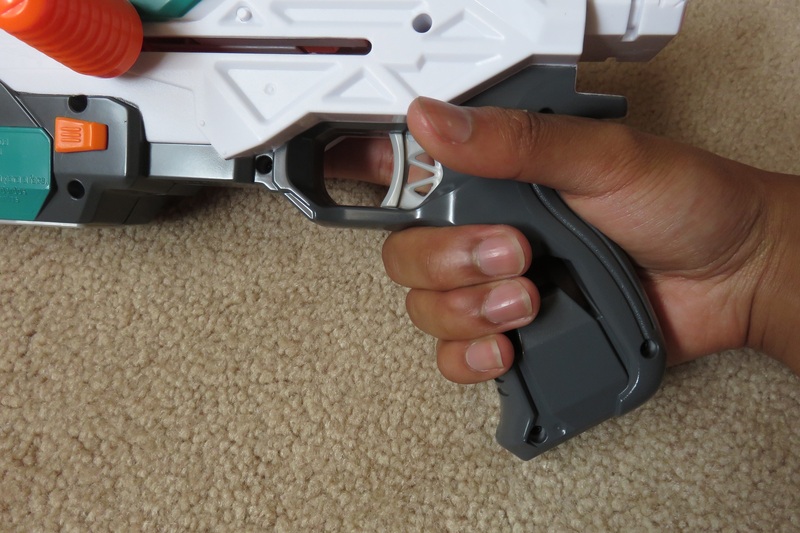 This is always in issue in blasters with Smart ARs, however is especially prevalent in the Mega Launcher. All too often I would slam the pump back expecting to fire a single Mega a decent distance, only to have two Mega flop out of the barrels. Besides being undesirable for consistency’s sake, double-firing also often results in the wasting of one, if not both, of the Megas fired. 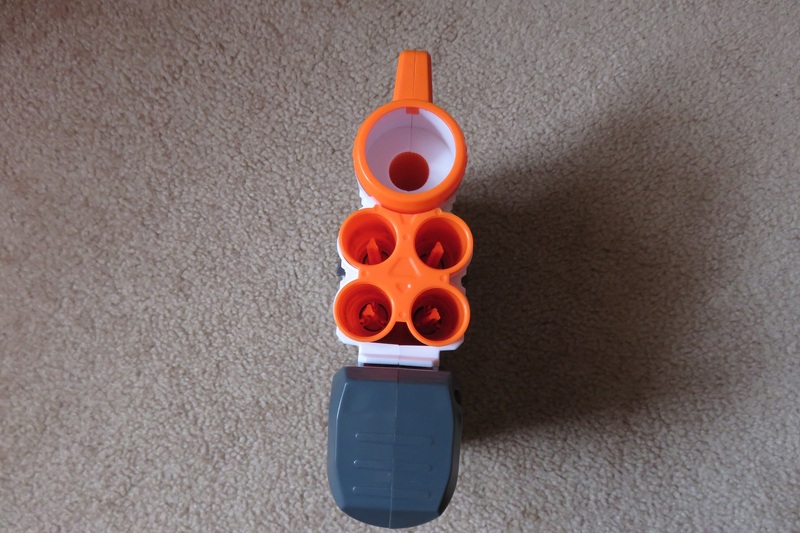 From my experience, the top two barrels are the ones most likely to double-fire. Next to a variety of other barrel extensions. 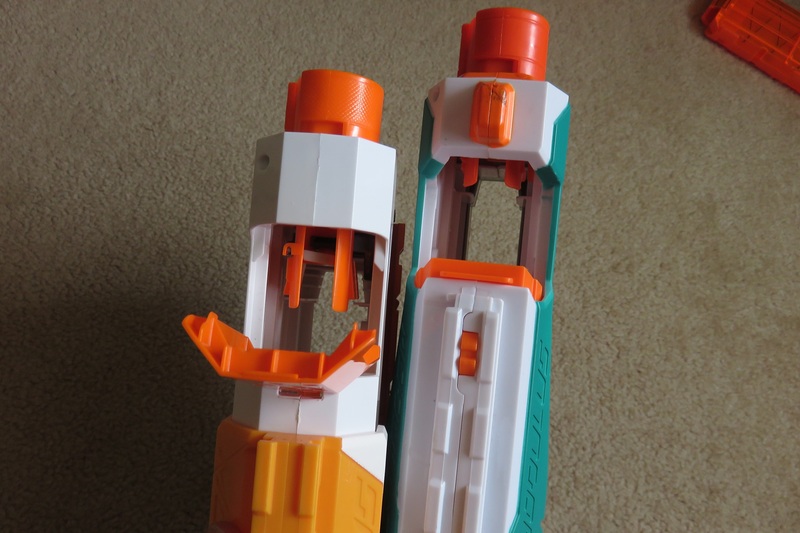 As mentioned earlier, the Mega Launcher is a rather stubby piece, and this image shows it next to a variety of other barrel extensions. 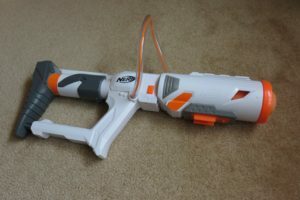 The Missile Launcher is an unusual two-part blaster, consisting of a tac rail attachment and a stock, connected by an air hose. 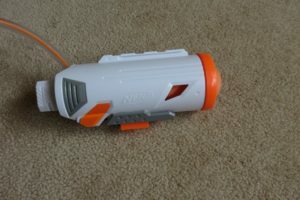 Side view of the Missile Launcher attachment. 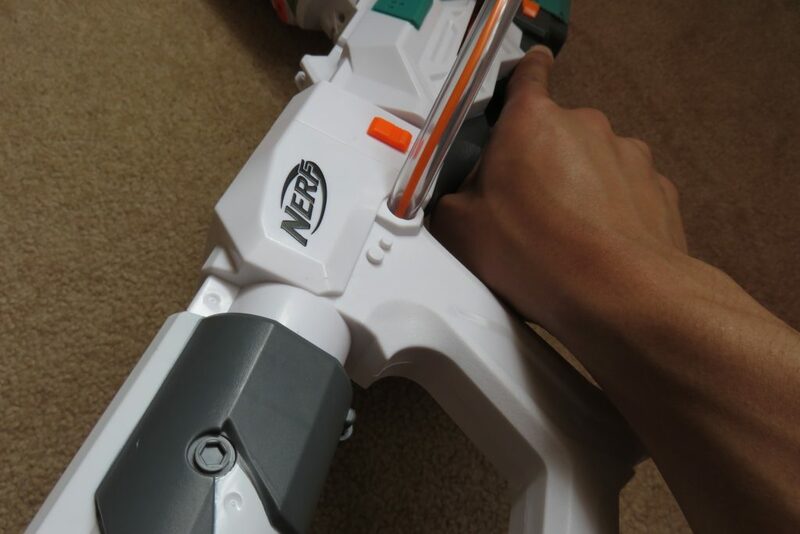 Looking into the Missile Launcher attachment. 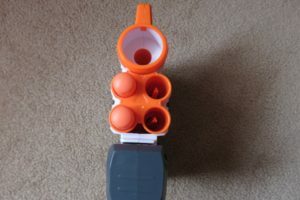 Small tac rail on top. Missile loaded into the Launcher. 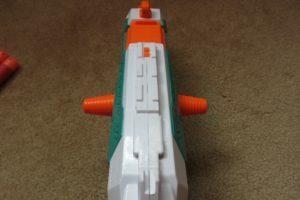 Missile loaded, front view. 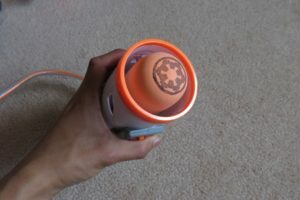 Note that the Imperial logo is my labelling method. The Missile Launcher module is a very simple piece. 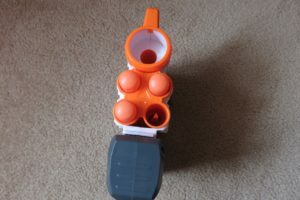 It consists purely of a hollowed cylinder containing a rocket peg, with a stock attachment point. 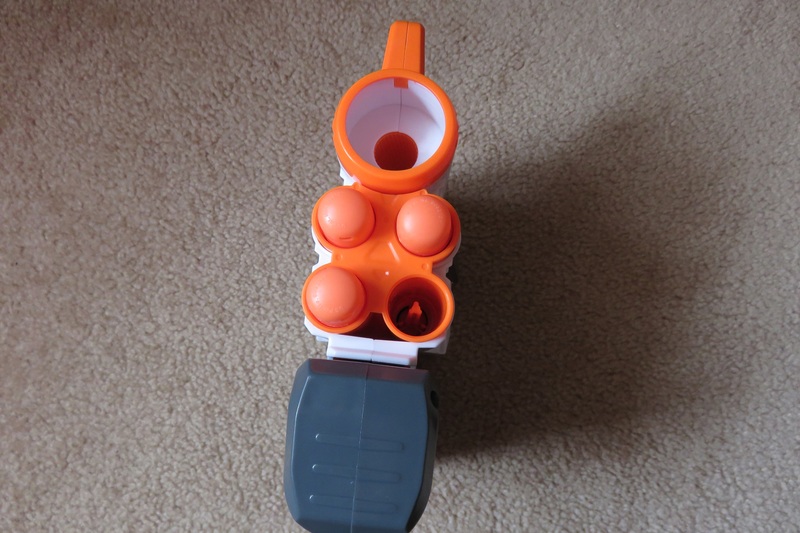 It can be attached to tac rails, and also has a tac rail on the top. The air hose attaches to the top, and feeds into the missile peg. 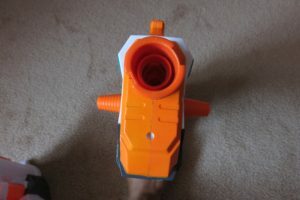 The Missile Launcher module is essentially identical to the barrel of the Thunderblast or Demolisher missile launchers. Focusing on the stock piece of the Missile Launcher. 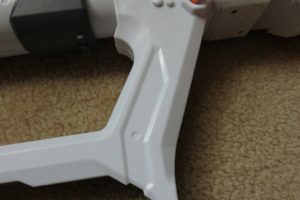 Close up of the handle on the stock. 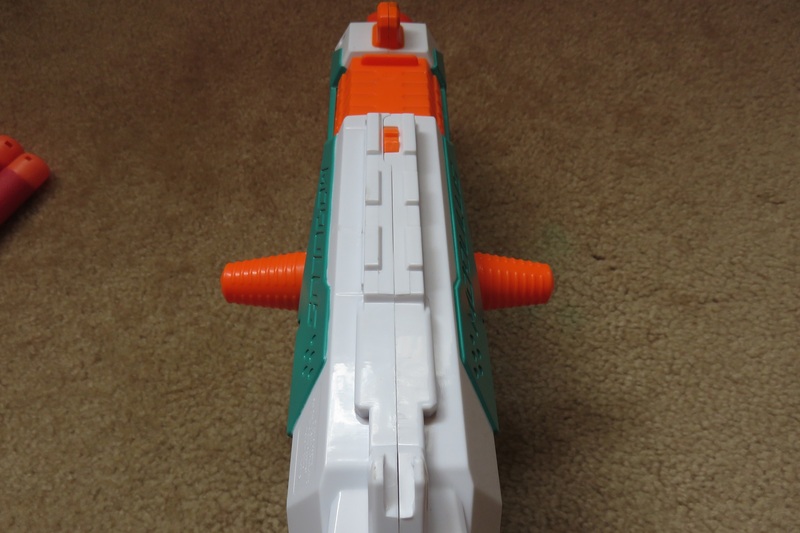 The Missile Launcher is another pump-to-fire blaster, however its pump is not under its barrel. Instead, the pump is in its stock piece, and the air runs through a hose connecting the two pieces. The pump however is quite stiff, and as it is in the stock, it prevents shouldering of the blaster when firing the missile. This is a great detriment to accuracy and consistency as it is nearly impossible to fire off a stable shot. Next to a variety of stocks. As just a stock, I quite like the Missile Launcher stock. It’s a decent length and it’s quite sturdy. 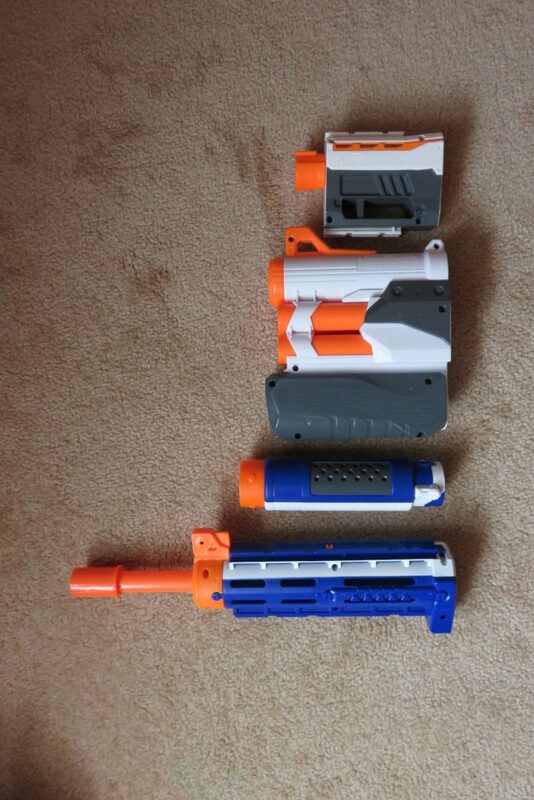 Length-wise it comes in just behind the Lightningstorm and Raider stocks, but ahead of the Demolisher stock. Stock handle too close to the real handle. I have one complaint with the stock: its handle is quite far forward. So when attached to a blaster, it leaves a very small space behind the blaster’s handle. This can be a little tight and uncomfortable for certain grip positions. 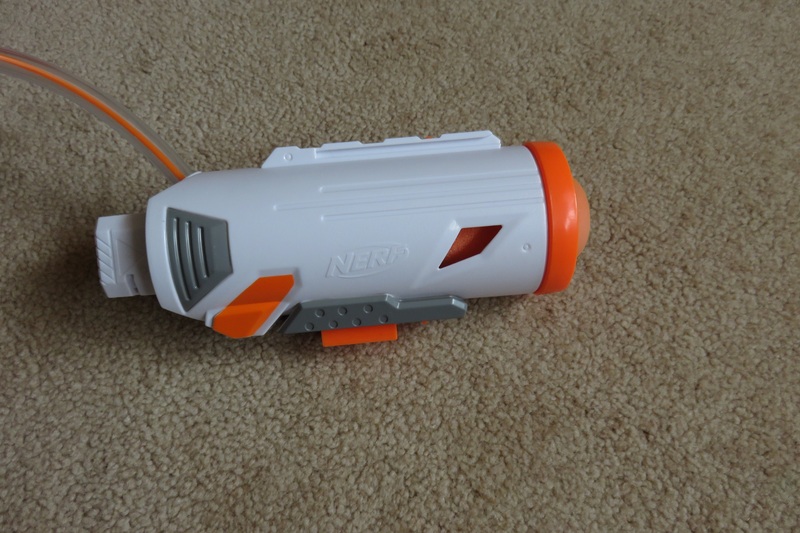 Missile Launcher assembled into its standalone form. Missile Launcher assembled and loaded. 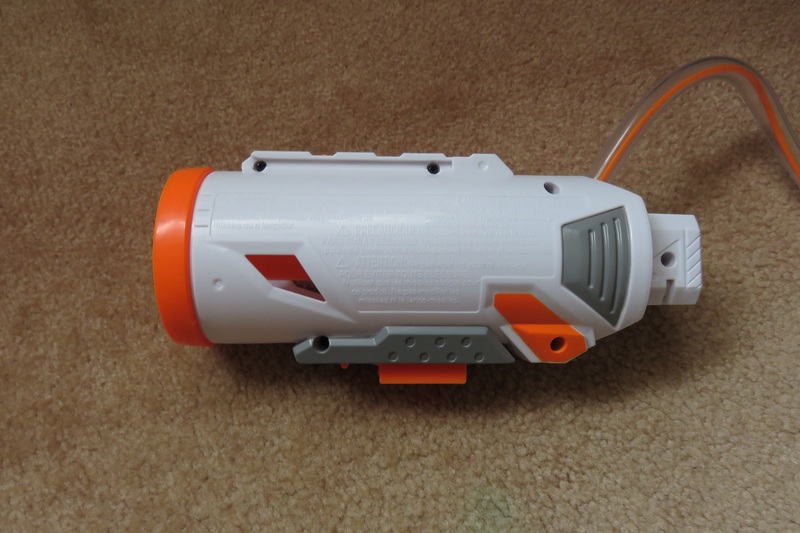 When not attached to another blaster, the Missile Launcher can be assembled into a standalone blaster. It is quite compact, however the same problems still apply. 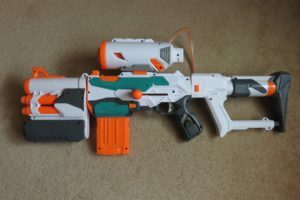 Since the stock is the pump, the Missile launcher cannot be shouldered, so stable shots are almost impossible to make. Furthermore, I personally find the lines on the stock handle to be a little sharp and uncomfortable. 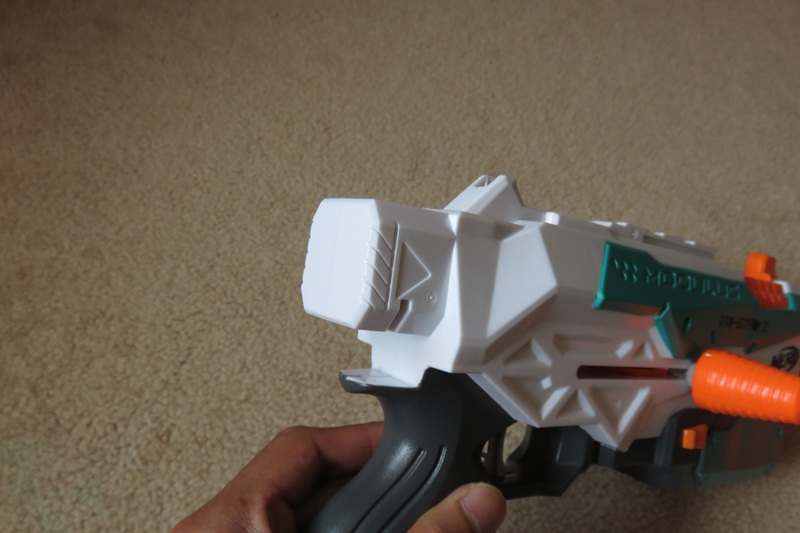 The Tri-Strike fully assembled is an odd piece. 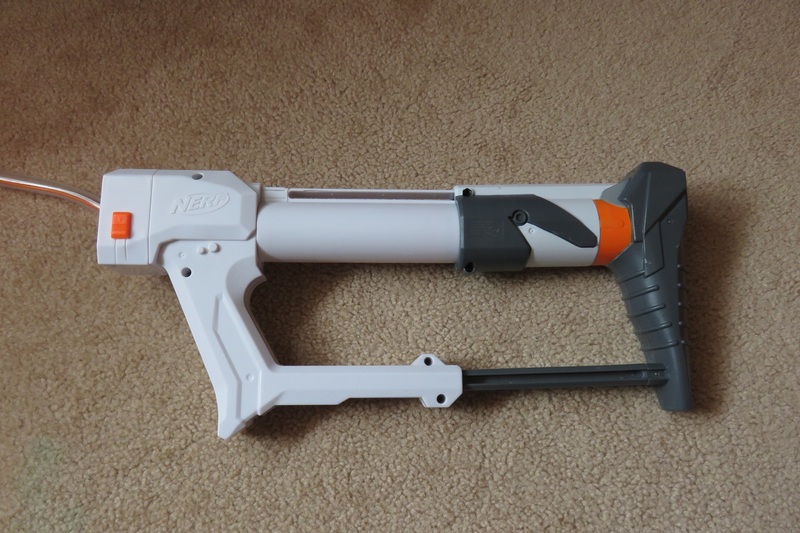 On the one hand, it looks like a cool, complete rifle-sized blaster, and every component is usable. On the other hand, all the extra components make the Tri-Strike quite hefty and bulky, and the Missile launcher is still very poor to use. The extra weight makes it even more difficult to get a stable missile shot off. Finally for performance. How do the Tri-Strike and its component blasters compare to the rest of Nerf’s offerings? The Tri-Strike’s range is about standard for a grey trigger blaster: around 8-10 metres with Modulus/Elite darts. The Mega Launcher is rather erratic, though typically achieves 8-12 metres if it doesn’t double-fire. The Missile Launcher is similarly inconsistent–even more so as it cannot be braced against your shoulder and fired effectively. I have so far been unable to fire a Missile further than 9 metres without angling the Missile Launcher very high up. Accuracy is also about standard from the Tri-Strike: most shots make it through a doorway at 8 metres but a significant portion don’t. Again, this is primarily due to Modulus/Elite darts being horribly inaccurate, and switching to a more stable dart type greatly improves accuracy. The Mega Launcher is quite inaccurate, partly due to being pump-to-fire, but also partly due to Megas being horribly unstable. Its one consolation is that if the Mega Launcher is mounted on a blaster with a stock, it can at least be braced reasonably well against your shoulder. The Missile Launcher on the other hand, has absolutely no accuracy of which to speak. Since its stock is its pump, it is practically impossible to brace the Missile Launcher, or fire it with decent power as well as stability. Rate of fire is generally a bit more promising. 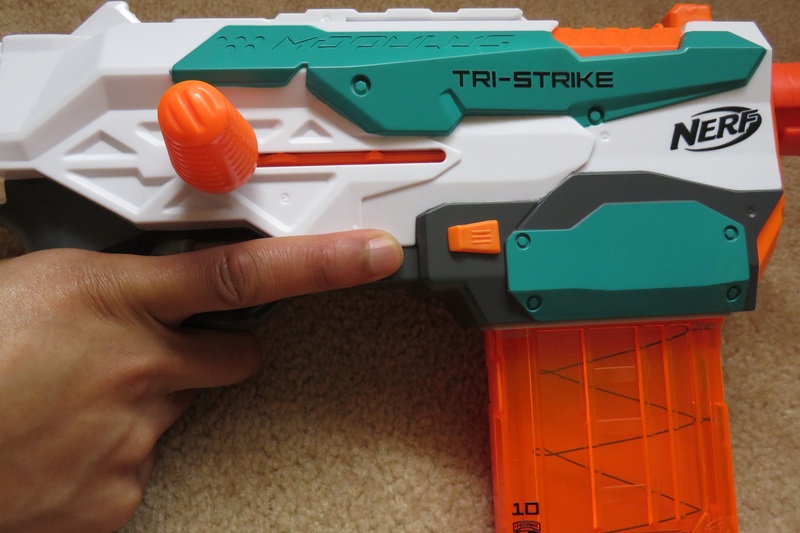 The Tri-Strike has slam-fire, putting it a step above its Retaliator/Recon MkII brethren. 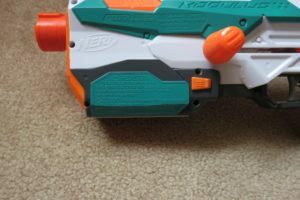 The stiffness of the bolt in slam-fire does limit slam-fire to a little slower than comparable pump action blasters, I’d estimate around 4 darts a second is the best you can achieve. 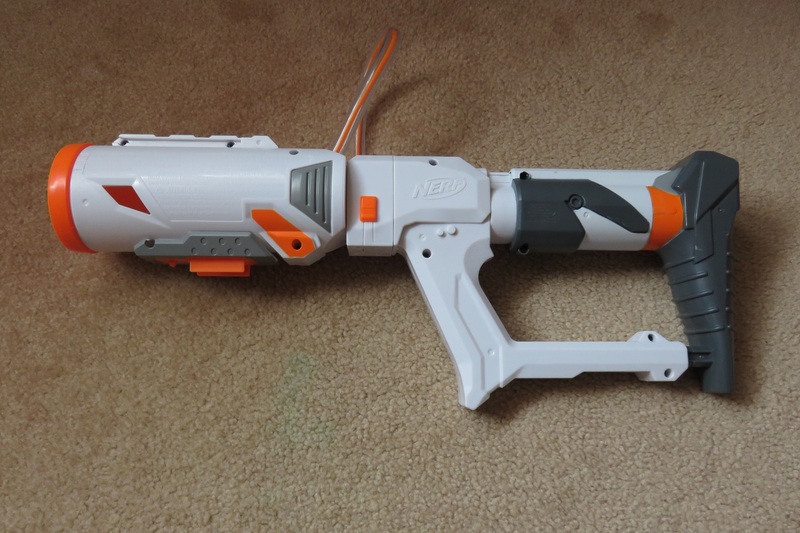 With the Mega launcher’s somewhat ergonomic pump action, it can also achieve a decent ROF, I’d estimate around 3 darts a second. 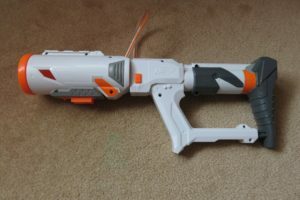 It is limited by the stiffness of the firing pump stroke, due to it being pump-to-fire. Since the missile launcher is a single shot, it can only achieve 1 missile every couple of seconds. 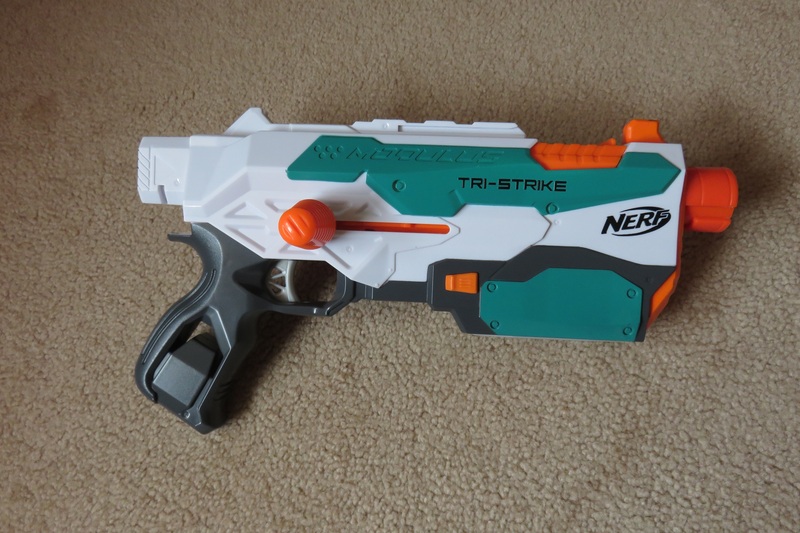 The base Tri-Strike blaster functions essentially like a base Retaliator. 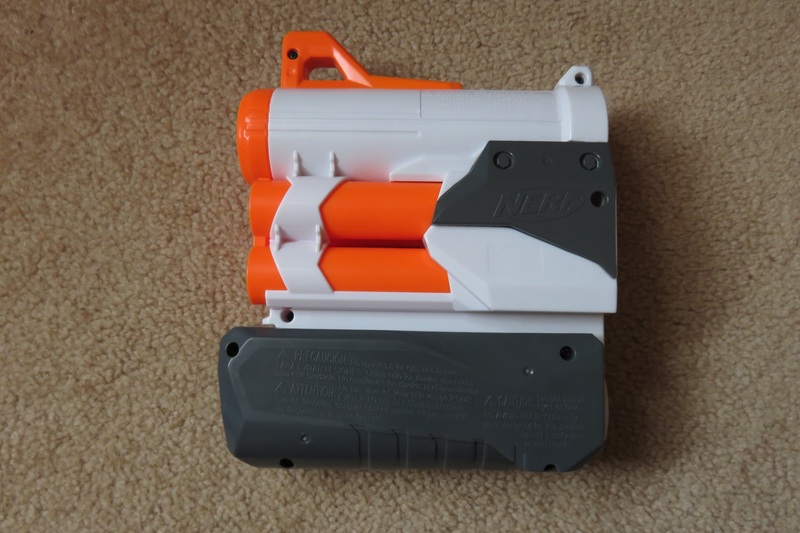 It’s a relatively compact clip (mag) system blaster, and will work decently as a secondary/backup, or a small primary ideal in close quarters. The bolt handles will make holstering or carrying on a sling more annoying than with a Retaliator, and furthermore, a grey trigger Tri-Strike is noticeably weaker than a grey trigger Retaliator. 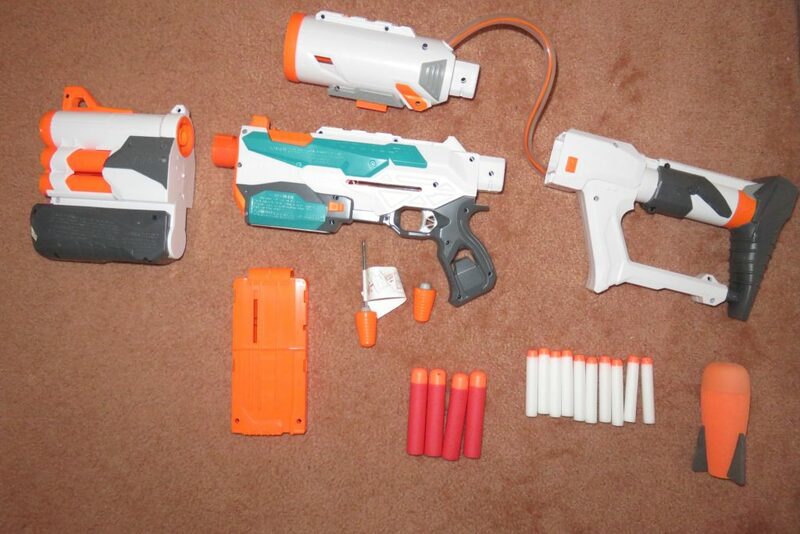 It will still work decently well in close quarters. 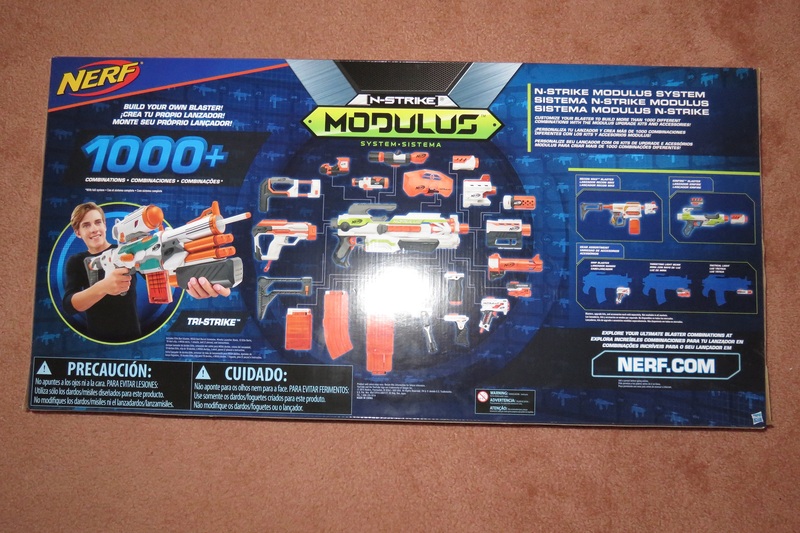 The Mega Launcher is only suitable as a Mega firing backup/emergency. 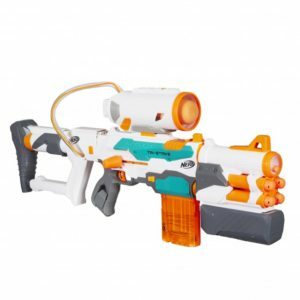 It isn’t particularly accurate, consistent or powerful, and as such won’t be a very good general combat blaster, especially with its tendency to double-fire. Rather, its main use would be in games where Megas have special abilities (for instance particular zombies that can only be stunned by Megas). 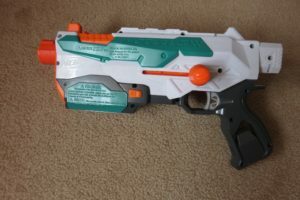 A further disadvantage is the inability to use a pump grip if the base blaster is a Retaliator/Recon MkII/Tri-Strike. 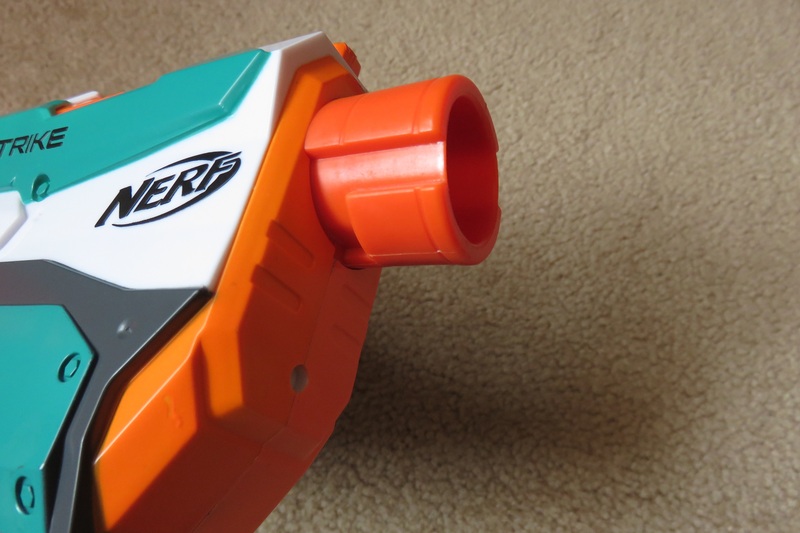 A seperate Mega blaster would be a much more effective option for actually firing Megas, though may not be ideal. The Missile launcher is even less useful, as it is rather weak and very difficult to use consistently. It is effective only within a very short range, and is vastly outclassed by most other rocket launching blasters available. That said, it is quite compact and could work as a stop-gap solution in a pinch. 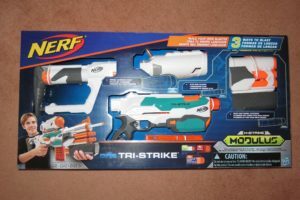 The Tri-Strike is available for 50-60AUD, being available for 50AUD from a variety of stores including Target and Kmart, and BigW during sales. I purchased mine for 50AUD. Though I was by no means ripped off, it didn’t feel like particularly good value to me. 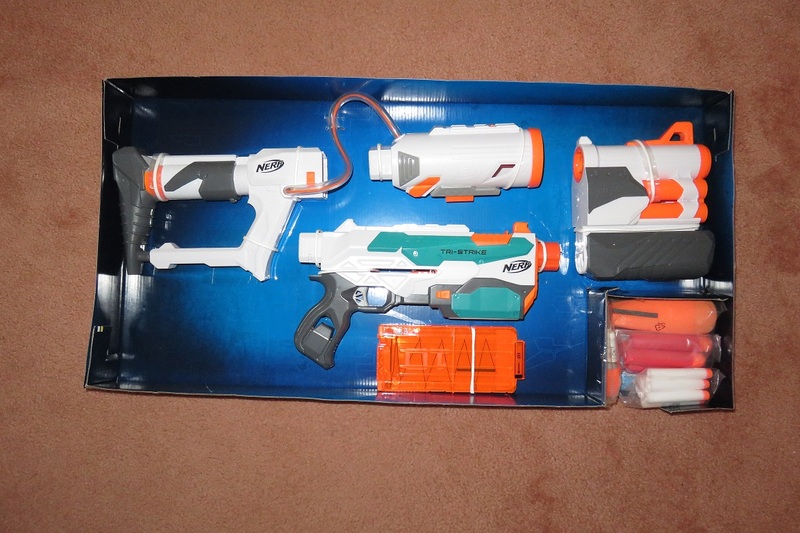 The Tri-Strike set does effectively include 3 blasters in one, however the two secondary blasters lack triggers, and are generally not very good at blasting. 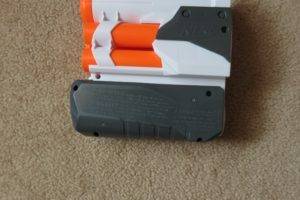 The inclusion of a unique 10 dart mag instead of a more common–and more useful–12 dart mag is very odd, and further adds to the feeling that Nerf is deliberately cheaping out and not making much effort. I would only recommend the Tri-Strike if you’re specifically looking for fun and goofy attachments, rather than useful or practical parts. 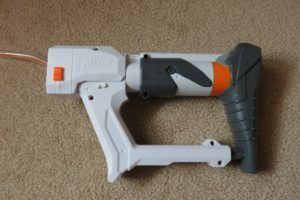 If you’re looking for an overall game-practical blaster, I’d definitely recommend the Retaliator as a superior alternative. Since the Tri-Strike itself is essentially a Retaliator, it can be modified in basically the same ways. An upgrade spring and a pump grip would quickly elevate it to being a solid all-round springer, effective in “superstock” and HvZ type events. There are many other mods that can be done to the Retaliator and likely the Tri-Strike, however documentation on such is very scarce for the Tri-Strike. Generally speaking, the Retaliator/Recon MkII are a much more popular platform to use than the Tri-Strike, because the former are compatible with a lot more aftermarket parts. As for the secondary blasters, there’s not much to be done. Their power is entirely dependent on arm strength, and there’s nothing that can be done to improve performance short of entirely new internals. Improving their plunger seals would help efficiency, but again, power is still solely dependent on arm strength. 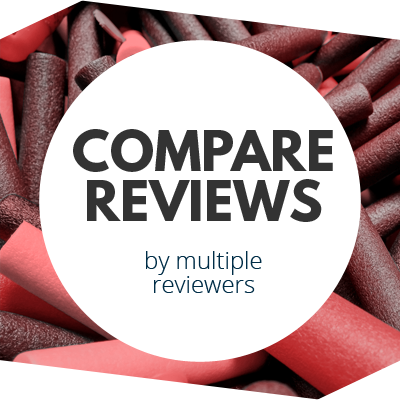 You can also find the same review on my own blog: Outback Nerf. 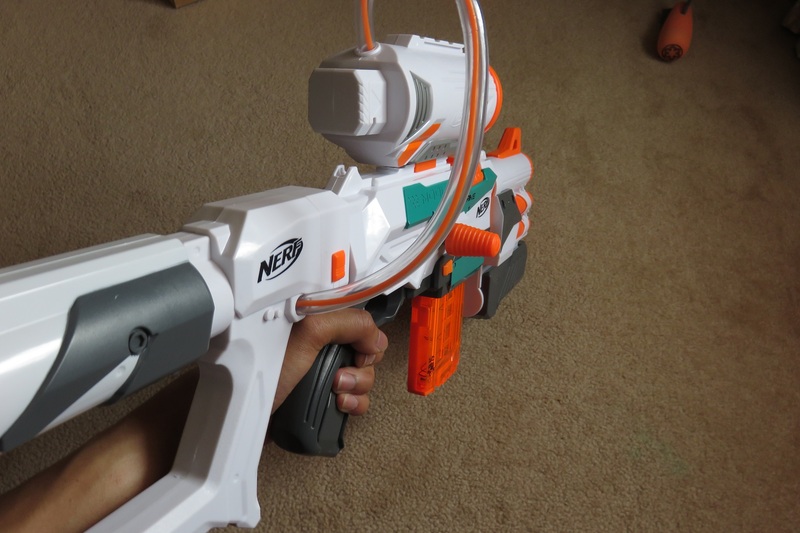 This entry was posted in Dart Blasters, Reviews and tagged australia, grey trigger, modulus, nerf, review, tri-strike on December 8, 2016 by Outback Nerf.